Congrats, Mrs Brown, on 35 years of service to GGUSD! G Tennis: Undefeated league champs, team & singles. Congrats, Coach Lu! Drumline: 1st place in competititon@West Covina 3/2/19! In March 2019 Garden Grove High School was named as a California Distinguished School! GGHS is one of only 74 high schools in California and only 11 in Orange County to earn this distinction by closing the achievement gap as measured by California School Dashboard indicators. In particular GGHS showed significant growth in the dashboard’s Academic Indicator which is a reflection of the recent growth in performance on SBAC testing in English-Language Arts and math. This is truly an honor and testament to the hard work of students, faculty, and parents. We’re all so proud to be ARGOs!! Click the link above to see the latest AVID Newsletter with features on student athletes, the college trip to northern California, Simon Scholarships and more. 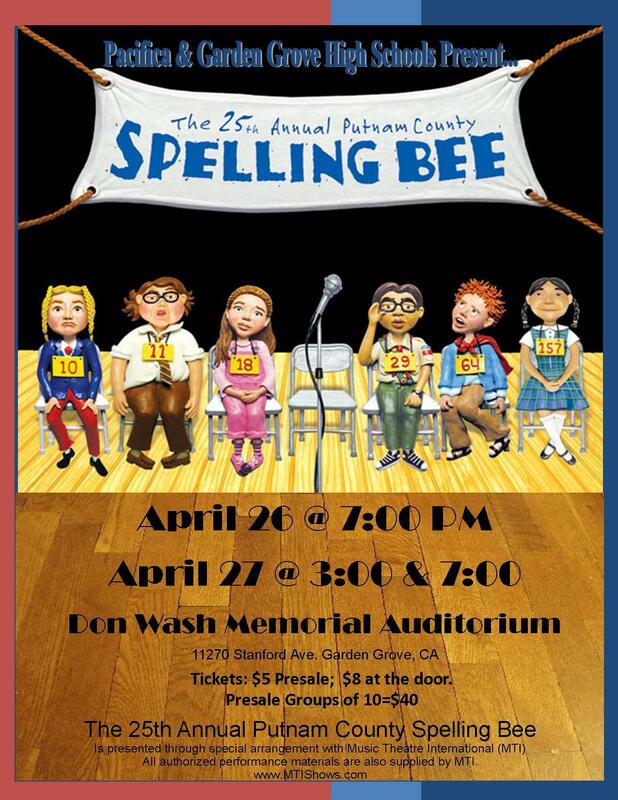 GGHS & Pacifica are combining forces again this year for the spring musical--"The 25th Annual Putnam County Spelling Bee"--to be performed at Don Wash, April 26 & 27 at 7pm, along with a 3pm matinee on the 27th. It's sure to be another great show, so get your tickets in Room 725 for $5 ($8 at the door at showtimes). Click the link above to download a small promo poster. Click the link above to go to a page with links to download the applications for GGHS-related scholarships: Michael Monsoor Memorial Scholarships (three $500 awards) and the two GGHS Alumni Association Scholarships (two $750, one $1000). Go for it, seniors! Click title link above to go to GGHS Guidance page, where you can find the updated scholarship list--over 20 scholarships available, many with deadlines in the next 1-4 weeks!! Check it out, seniors! Click the link above to view the inaugural broadcast! Follow us and get up to date news and Argo information. The commemorative bricks project is moving along! Click the title link above to access the "bricks" page and order form.